For other uses, see Almere (disambiguation). Almere (Dutch pronunciation: [ɑlˈmeːrə] ( listen)) is a planned city and municipality in the province of Flevoland, Netherlands, bordering Lelystad and Zeewolde. The municipality of Almere comprises six official areas that are the districts of Almere Stad (which is further split up into Almere Stad Oost, Almere Stad West and Almere Centrum), Almere Buiten and Almere Pampus (which is currently being designed), and the boroughs of Almere Haven, Almere Hout and Almere Poort. Four of them feature official district or borough offices. 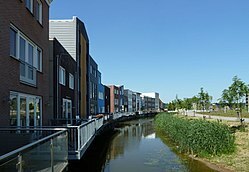 Furthermore, it also comprises the unofficial historic district and neighborhood Oostvaardersdiep, which has an active semi-self-governing community, and the planned district of Almere Oosterwold. Almere is part of the Amsterdam Metropolitan Area (MRA). Almere is the newest city in the Netherlands: the land on which the city sits, the Southern Flevoland polder, was reclaimed from the IJsselmeer from 1959 to 1968. The first house was finished in 1976, and Almere became a municipality in 1984. It has the largest population of the municipalities in Flevoland with 202,764 citizens in 2017 and the 7th largest in the Netherlands. In October 2007, the city council of Almere made agreements with the government to expand the city to 350,000 inhabitants by 2030. The original plans for the IJsselmeerpolders saw the land being used for agriculture. However, after World War II housing was needed for the rapidly growing population of Amsterdam and two towns were planned in the polders Oostelijk Flevoland and Zuidelijk Flevoland. The town in Oostelijk Flevoland became Lelystad. The town in Zuidelijk Flevoland was still called Zuidweststad (English: South West City) on the first sketches, but in the 1970s it became called Almere, named after the lake Almere, the early medieval name of the Zuiderzee. The first house in Almere was finished in 1976. At that time the town was still controlled by the Openbaar Lichaam Zuidelijke IJsselmeerpolders (Z.IJ.P. ), with a Landdrost. In 1984 Almere became an official municipality. Originally, Almere was envisioned as a town with multiple centres. This idea was later abandoned in favor of allowing neighbourhoods like Tussen de Vaarten to be built. There is also a difference between the way houses are built in the oldest and the newest parts of the city. The housing plan in Almere in the 1970s was basic functionality and a levelling of social status. However, starting in the 1990s more exclusive homes with striking designs were built (notably in the Regenboogbuurt). Franc Weerwind (D66) serves as Mayor of Almere since 9 September 2015. Following the Dutch municipal elections, 2014 the current municipal council was inaugurated. The nationalist Party for Freedom had won the most seats in the local elections, which was both national and international news due to the controversial statements of its leader Geert Wilders. Even though the largest party they didn't take part in the local administration. The first municipal council was installed on 2 January 1984 in the presence of the then-Minister of the Interior Koos Rietkerk. The council elections took place on 21 September 1983. Prior to 1984 Almere had an Adviesraad, which was chosen every 2 years (1978–1980, 1980–1982, 1982–1984). This Adviesraad was made up of different political parties similar to a local council. On 11 March 1977 the first adviescommissie was elected. It consisted of 5 people that were chosen on personal title. Since 2018, the council of Almere has comprised a total of 45 members. Almere is the home of Almere City FC and the home of Almere Pioneers. In Almere there are 10 bus lines which service the urban area. M3 Almere Centrum Station - Almere Beatrixpark - Almere Muziekwijk Runs every 5 minutes Mon-Fri during daytime hours (every 7.5-15 minutes on evenings and Sundays). M4 Almere Centrum Station – Almere Literatuurwijk – Almere Gooisekant-West – Almere Poort Homeruskwartier – Almere Poort Station Runs every 5 minutes Mon-Fri during daytime hours (every 7.5-15 minutes on evenings and Sundays). M5 Almere Centrum station - Almere Danswijk - Almere Parkwijk station - Almere Sallandsekant Runs every 5 minutes Mon-Fri during daytime hours (every 7.5-15 minutes on evenings and Sundays). M6 Almere Centrum Station – Noorderplassen Runs every 7 minutes Mon-Fri (every 15 minutes on Saturdays and every 30 minutes on Sundays). M7 Almere Centrum station - Almere Parkwijk station - Almere Buiten station - Almere Oostvaarders station Runs every 5 minutes Mon-Fri during daytime hours (every 7.5-15 minutes on evenings and Sundays). Monday to Friday, most city buses run about every 5 minutes (10 times every hour) during daytime hours. Saturdays, only a few city bus lines run every 7,5 minutes during daytime hours; most of them run every 12–15 minutes. Sunday, most of the city buses run every 15 minutes (with some buses running extra runs during certain hours) and M6 which only runs every 30 minutes. There are a few overnight bus lines (Mon-Sat nights only): N21, N22 and N23. They run under the Keolis internal name nightGo (but are operated by R-Net branded regional buses). The bus company running almost all buses is Keolis Netherlands. Local buses (city buses) run under the name allGo. In the buses one can use the national transportation chipcard (smart card), subscriptions or one can buy bus tickets of allGo in the bus or at TVM's (the latter only Downtown). 323 Almere Parkwijk station - Almere Poort Station – Muiden P+R - Amsterdam Bijlmer Mon-Fri between 5.30 AM and 10.30 AM and between 14.00 PM until the end of the day. Sat only after 18.00 PM and Sun all day long. 326 Almere Centrum Station – Busstation 't Oor – Almere De Kemphaan – Blaricum Carpoolplaats Mon-Fri only; does not run on evenings and weekends. 159 Almere Centrum Station – Almere Veluwsekant – Almere De Kemphaan – Almere Hout – Zeewolde – Harderwijk Mon-Fri only; does not run on evenings and weekends. The last two buses of the day terminate halfway at Zeewolde Kwartiermakerslaan. Closed-system in Almere. 160 Almere Centrum Station – Busstation 't Oor – Almere De Kemphaan – Zeewolde De Eemhof – Amersfoort Vathorst Station Runs 7 days a week, but only every 2 hours and only between 10 AM-10:30 PM. This bus is actually part of the OV Regio IJsselmond concession, but Keolis operates it under contract with Syntus Overijssel-branded buses. 322 Almere Parkwijk Station – Almere Flevoziekenhuis – Almere Gooisepoort – Almere Poort Station – Muiden P+R – Diemen Diemerknoop – Amsterdam Amstel Is allowed to use the emergency lanes on the highway parts of the route to maneuver past traffic jams. 327 Almere Haven Centrum – Busstation 't Oor – Muiden P+R – Diemen Diemerknoop – Amsterdam Amstel Is allowed to use the emergency lanes on the highway parts of the route to maneuver past traffic jams. 328 Almere Haven Centrum – Busstation 't Oor – Muiden P+R – Diemen Diemerknoop – Amsterdam Bijlmer Closed-system in Amsterdam. Is allowed to use the emergency lanes on the highway parts of the route to maneuver past traffic jams. Line 159 is operated by the bus company OV Regio IJsselmond. Since April 2012, there was a rush hour route, 150, to Utrecht which connected Almere directly with the University Area of Utrecht called De Uithof. (This was previously done by former bus line 295). Due to budget cuts, line 150 was scrapped on July 9, 2016. ^ "The municipal executive". Gemeente Almere. Archived from the original on 2013-11-05. Retrieved 1 September 2013. ^ "Postcodetool for 1315HR". Actueel Hoogtebestand Nederland (in Dutch). Het Waterschapshuis. Archived from the original on 21 September 2013. Retrieved 1 September 2013. ^ info@almere.nl. "Stadsdelen - Over Almere - Gemeente Almere". www.almere.nl. ^ "Pampus - Gebiedsontwikkeling - Gemeente Almere". almere20.almere.nl. ^ info@almere.nl. "Gebiedskantoren - Contact - Gemeente Almere". www.almere.nl. ^ (in Dutch) Lijst van grooste gemeenten in Nederland. Retrieved on 2010-12-31. ^ (in Dutch) Schaalsprong Almere 2030, PDF. Retrieved on 2008-06-09. ^ (in Dutch) Feiten en cijfers over Almere, Almere.nl. ^ (in Dutch) Gemeente Almere: Partnersteden. Retrieved on 2008-02-23. ^ (in Dutch) Algemene Informatie. Retrieved on 2008-02-23. ^ (in Dutch) Gemeente Almere: Stadsdelen. Retrieved on 2015-08-29. ^ (in Dutch) Sociale Atlas 2007 Bevolkingsopbouw[dead link]. Retrieved on 2008-02-23. ^ "Almere Climate Data 1981–2010". ^ "CBS StatLine - Selecteren van gegevens". statline.cbs.nl. ^ "Lijn 295 Almere-Stad Station Centrum - Utrecht AZU - OV in Nederland Wiki". wiki.ovinnederland.nl. ^ "Snelwegbus Utrecht-Almere stopt ermee - RTV Utrecht". www.rtvutrecht.nl. Wikimedia Commons has media related to Almere. Wikivoyage has a travel guide for Almere.